I found this one online. I just have three words – no thank you! 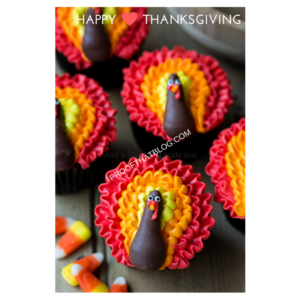 A couple of years ago, I posted an article about Thanksgiving and other holidays and grammar issues. Since it is time again, here is an encore of that article. A friend sent this to me. I actually missed the error the first couple of times I read through it quickly, but it is there. I also looked up “Oftentimes,” which, while correct, is archaic and could easily be replaced with “Often.” Our goal should always be to make our writing more readable. I saw this sign at an event I was attending recently. 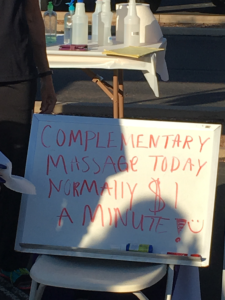 “Complementary” means something that completes or makes perfect (which a massage always does for me, but that’s not what they mean here). “Complimentary” means free of charge (which IS what they mean here). 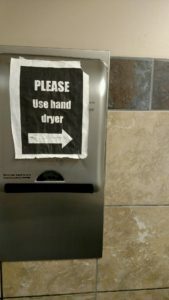 Grammar Giggle – Where, Oh Where, Is The Hand Dryer? Comments Off on Grammar Giggle – Where, Oh Where, Is The Hand Dryer? A friend found this on our recent trip to Memphis in a restroom. 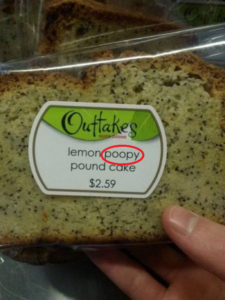 Sometimes it isn’t an error in words that makes a Grammar Giggle. Sometimes it is an error in direction. While this sign tells you to use the hand dryer on the right, the hand dryer is actually on the left. Some good citizen tried to change the arrow direction, which only made me giggle more. 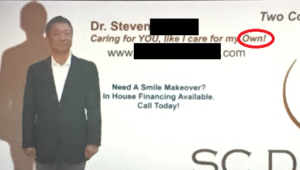 A friend snapped this picture of an advertisement at a movie recently. My question is like you care for your own what? And why is “Own” capitalized, but the other words are not? And why is there a comma there? ENCORE – A.M., P.M., Daylight Saving Time–Could Time Get Any More Confusing? Comments Off on ENCORE – A.M., P.M., Daylight Saving Time–Could Time Get Any More Confusing? Sunday, March 9, marks the beginning of daylight saving time throughout most of the United States. Being an Arizona native, I remember when we tried daylight saving time here. It’s tough to put a kid to bed when the sun is bright overhead. Arizona has not observed daylight saving time for many years, but that’s not the intended topic. While we’re talking about time, the difference between a.m. and p.m. is important. 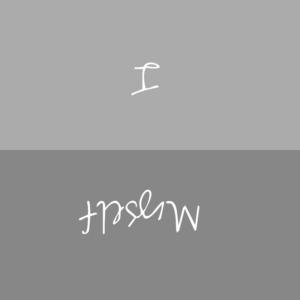 The designation “a.m.” stands for the Latin term ante meridiem and means the time from midnight to noon. The designation “p.m.” stands for the Latin term post meridiem and means the time from noon to midnight. While people seem to grasp that concept, the exact times of midnight and noon seems to confuse them. The time 12:00 a.m. is midnight (it is between midnight and noon) and 12:00 p.m. is noon. Note that 11:59 at night is 11:59 p.m. because it is between noon and midnight. It is always good to confirm whether the a.m. or p.m. is correct so people don’t think an event is 12 hours earlier or later than intended. To those of you who will “spring forward” this weekend, enjoy it and keep the time straight so others know exactly what time you are talking about.